Our winter school holiday ended and I spent the day with the boys on my own while Sam endured 7 hours of meetings during a teacher 'planning' day. I theoretically would feel sorry for him, except for the fact that at his school he has free access to a fancy espresso machine, an object I covet deeply. Endless, needless meetings are much easier to cope with when you have a warm cuppa in hand, no? Instead of heading to our usual tidepool spot by Old Man's Pool, we ventured to the harbour. The tide was relatively low and I walked out onto some rocks to get a picture of a nearby pelican. Jackson followed me out onto the rocks and immediately spotted an octopus. He has an incredibly keen eye for wildlife; he spotted the only other octopus we've seen here as well. As you can see, its camouflage works wonderfully with the sandy ocean floor and it is only visible when the orange underside of the tentacles can be seen. 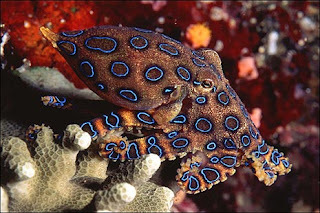 It seems as if no outing in Australia is complete without the very real possibility of a poisonous animal lurking around the next corner--I immediately looked to make sure it wasn't the deadly blue-ringed octopus. 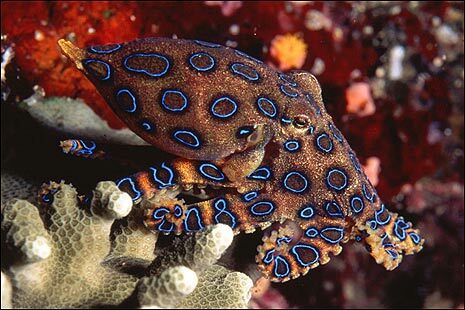 The electric blue rings on this octopus are normally not visible but flash brightly when provoked. There is no antidote for these gorgeous creatures' venom; the only treatment to avoid death is immediate pressure on the wound and then being placed on artificial respiration while the venom runs its course--not exactly how I strive to create a memorable day out with my kids. After mentally checking the 'Won't Kill My Kid' box in the trusty and voluminous Official Good Parent Checklist I store in head, Jackson stuck out his hand to greet the octopus, who reached out its tentacle in return. Now, I have to make an ugly confession. As we were admiring the octopus, I couldn't help but think of the mouthwatering octopus and surf clams with udon noodle salad recipe I had just seen on SBS' Island Feast with Peter Kuruvita. Before I leave Australia, I'd absolutely love to cook fresh octopus for dinner--and yes, I felt guilty because the octopus is such a bright, clever (albeit tasty) creature. By this time, a small crowd of kids gathered around, and they proceeded to spend the next two hours scrambling on the rocks, problem-solving and strategizing different ways to catch the octopus. The kids had the time of their lives, and so did I--definitely one of the highlights of the year, and the fun stopped only because of the eventual need to get home and have some lunch. If you're keeping track, the official score is Octopus: 1, Kids: 0. My octopus salad recipe will have to wait...for now. We spotted a fruit at the grocery store today that we had never seen before in the States. Have you heard of custard apple? The vast quantities of fruit consumed in this household is already verging on the absurd, so one more can't hurt. The outside appearance doesn't necessarily scream 'eat me, I'm delicious! '; we hoped the inside would be more promising. I sliced it open, revealing a pear-colored fruit, with smallish almond-sized seeds found in different chambers. It was fairly sweet and had a flavor reminiscent of mango, a fruit everyone in this family loves. The custard apple family verdict? Alex: "It wasn't very good." Me: "I enjoyed trying it, but it isn't something I'd look for again." Has anyone tried custard apple, and if so, do you just eat it straight up or do you have a favorite recipe? We all woke up on our second Blue Mountain with caves on the brain. Jenolan Caves are known as Australia's finest, and we loved our visit to Yarrangobilly Caves during our first road trip in January. Simply driving up to the entrance of the carpark is dramatic in itself, and looks like something you'd see at Disney World. While our friends Kylie and Josh braved 1300 steps on the River cave tour, the four older kids joined a Junior Explorers class and Sam and I hung out with Kenyon on a self-guided tour. Sam and I are both pretty sweet on Kenyon, and with three kids it's always a treat to spend some good, quality time with just one--especially since when he's not throwing a royal fit about some perceived injustice (which happens quite a bit), he's a ton of fun to be around. Sam and I didn't listen to all that much of the audio tour, but Kenyon relished punching the correct number into the device and reciting bits and pieces back to us. This resulted in our tour consisting of Kenyon's cartoon voice saying, "Limestone formations...water absorbs carbons dioxide...stalagmites". I don't know if his voice will ever stop being that of a 2-year old, but at least he'll have a profitable future in voice-over work. We went on a bushwalk afterwards, and walked beside a pond that gets its brilliant shade of blue from light being refracted through dissolved limestone particles. ...but then realized that it was an elusive creature that we had really been wanting to see in the wild--a platypus! After platypus-watching, Kylie and Josh were crazy gracious enough to take all the kids back to the house so Sam and I could do one of Jenolan Cave's adventure tours--the Plughole. 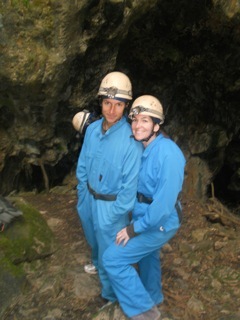 We abseiled down a short 8 meters into the hole to start the tour, and then squeezed our way down and through the cave. 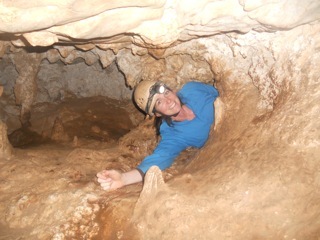 While the cave formations weren't spectacular, it was a ton of fun. Some spots were small enough that we had to lay on our side with our arm above our head and inch our way through--definitely not for anyone that borders on claustrophobic! Thanks to Kylie and Josh for good company and planning the trip--we're hoping to get back to the Blue Mountains once springtime hits for some more camping and bushwalking. We're in the middle of a two-week winter school holiday, and I have recently accepted the fact that I'll simply never be accustomed to the winter season happening in what has concretely been the summer months for the first thirty-three years of my life. To celebrate winter, we took off for a two-night trip to the Blue Mountains with our friends, Kylie and Josh Brightman and their kids. I told my kids that there may even be frost on the ground, and Alex said he couldn't wait to do snow angels. Ha! Sand angels are more common 'round these parts. I was especially excited that the house we rented for our stay had a woodburning stove, not really to keep warm but because it exponentially increases the cozy factor. Now, I grew up in flatter-than-flat Miami, but having lived in Colorado for more than a decade, I'm a bit snobbish about how people from flatter regions throw the term 'mountain' around. At 3,986 ft., the highest point of the Blue Mountains is quite bigger than 'Mount' Keira in our town (which rises to a measly 1,522 ft)--but it's still a far stretch to Denver's mile high altitude (not to mention the 53 peaks exceeding 14,000 feet). Still, this area of Australia is so beautiful, and right from the cute town of Katoomba we saw the most famous rock formation in the Blue Mountains--the Three Sisters. It was like herding cats on the hike we went on there--all five kids scampered ahead, weaving around groups of tourists and tromping in and around the muddy path. In typical kid 'the cardboard box is much cooler than the actual gift' fashion, the highlight of our pit stop in Katoomba for that whole lot was not viewing the majestic beauty of the Three Sisters or our hike winding down the cliff face--it was exploring a bushy area in the park adjacent to the public restrooms. 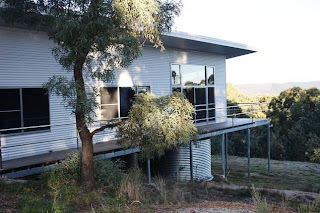 From Katoomba, we headed to Oberon and stayed at Casey's Bush Retreat. It's always a treat to stay at a rental home that does not have outdated country decor and shabby furnishings, and this place was great. I am, like any rational person, a wee bit obsessed with wombats. While I was heating up dinner, Sam, Josh and the kids explored and found a massive wombat hole a short walk from the house. And because there were no mothers present to provide a semblance of sanity, the natural next step was to send kids INTO the wombat hole for further exploration. These photos were taken by Jackson, who lucky for him (and luckier for his father) did not find himself face-to-face with a wombat protecting its turf. He went in far enough to tell me that 'it went up, down, around, and then broke off into different chambers'. If this kid grows up and takes an office job instead of doing something outdoors, I'll eat my shirt. A short time later, sunset was on full display from our porch. With the woodburning stove roaring and (ahem) the champagne cork popped, it was the perfect way to end this first day. (tap tap) Is This Thing On? Well, hello there blog, you long-lost friend. I've been busy, and in being busy I've missed writing about a big event around these parts. My parents braved the flight halfway around the planet to come for a visit! Mom arrived a day before Dad, and my mom's trip was made more comfortable by business class reclining seats and a United-issued down comforter that she may or may not have "accidentally" taken with her as she waved to the flight attendant and left the plane. Does my witnessing her snipping off the United tags to destroy evidence make me an accomplice after the fact? I'll have to dust off my criminal law textbook. Alleged theft aside, it was fun meeting Mom at the airport. On the way back, the bus driver insisted upon stopping at the Bulli lookout. You can't see the ocean in the picture, but take my word for it that the view was lovely. I'm grateful to the bus driver, because this is now my favorite picture of us. ...and she received the same warm welcome upon arrival at Kenyon's school. My parents' visit coincided with their 40th wedding anniversary. When I married Sam, I thought it was a good sign that we both came from families with strong marriages; I'm so thankful for how they've modeled what it means to be a partner through life. My dad, as my brother once noted, is the Mick Jagger of journalism; he's pretty well-known in his field. While he was here, he spent some time speaking at the University of Wollongong as well as some media organizations in Sydney and Melbourne. During one interview, he discussed computer-assisted reporting on a television program called Planet America. Of course I'm a bit partial because he's my dad, but friends from Miami and others might be interested to hear him talk about Hurricane Andrew; he begins a bit after the 24-minute mark found here. Between Dad's speaking engagements here in town and their weeklong trip to Melbourne, the month flew by and we all soaked up the inevitable spoiling that is synonymous with Nana and Papa. Since their visit also coincided with the school drama coming to a head, they were also a welcome distraction as Jackson struggled to deal with his frustration. One day with the kids in school and husbands working, Mom and I drove to Bundeena and took the ferry to Cronulla. Walking around, having a coffee at a cafe, and exploring the cute little town was a perfect way to spend the day together. One of the best experiences my family has had in this country has been seeing the unique wildlife actually in the wild. Seeing koalas up in the trees at Raymond Island and the wombat(!) nibbling on grass at Wilsons Prom are memories that I will never forget. Neither of those places are close enough to show visitors, so we settled on Wildlife Sydney during a long weekend outing. Koalas are pretty darn adorable wherever you see them, and I think Mom would have stuffed a koala into her purse if there were any eucalyptus trees growing back at home in Arizona. I never tire of taking ferries around Sydney--it's a gorgeous city to explore. The Depot Beach cabins are just a 2-minute walk from the beach, where kangaroos graze on plants and grasses right on the sand. Rainbow lorikeets, galahs, and king parrots are also everywhere. I think hanging out with the kangaroos and gorgeous birds at the cabin as well as exploring the seaside outcroppings was the highlight of the whole visit for us all; well, except of course, the outing to Birdland Animal Park to see visit my soulmate, the illustrious Bubbles the Wombat!! I mean, HONESTLY. She is just so darn adorable. That right there, that wombat snuggle, is worth braving the flight across the planet in itself. The folks at Birdland take in orphaned wombats and raise them until they can be released into the wild a few years later. The baby wombats go home with their caregivers each night. Yes, I'm telling you there's an actual career where one of the responsibilities is wombat snuggling. Man, I missed my calling bigtime with this whole law business. It sounds overly simplistic, but family is good; I like these people and I'm glad I don't normally live across the world from them. Love you, Mom and Dad!